WARNING: The following pseudo-review consists of a largely rambling mess of possibly incoherent reflections. It has been divided into two parts. Read beyond the score for more. ACKNOWLEDGMENT: I’m aware that the preceding warning is hardly enticing… but I’d rather you not read this post than read it and be annoyed that you spent your time doing so. I shared this quote with someone when I first stumbled on it and the response was one of shock and slight distress. I imagine that’s how a good portion of the population would react to it, but that quote is something that always connected with me. I hesitate to say that I’d be nothing without movies and I’m not sure that anyone (even Kuro-san) could mean that literally… except maybe Roger Ebert. Life Itself, based on Roger Ebert’s memoir of the same name, chronicles his life from a boy publishing his own newspaper in Urbana to his surprise promotion to the film critic position at the Chicago Sun-Times (it was at this job that he didn’t apply for that he won the Pulitzer Prize) to his meteoric ascent to become probably the most powerful and influential film critic in America. 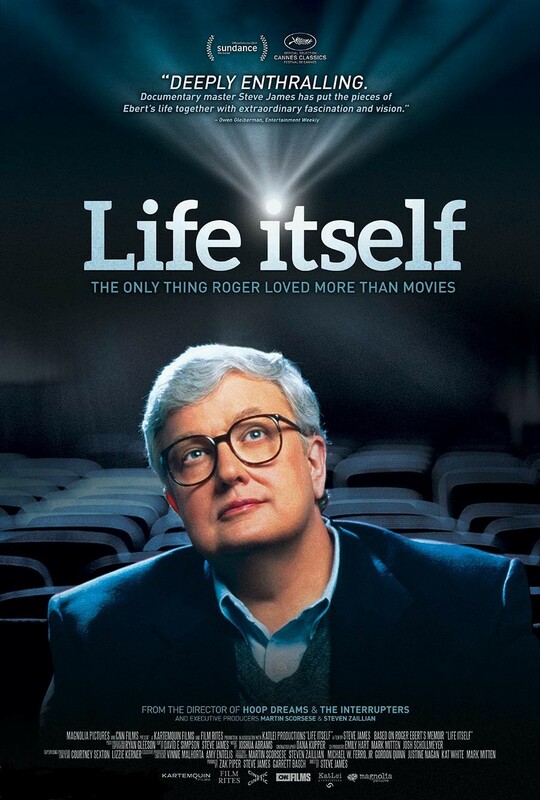 The documentary is unflinchingly honest in its examination of Ebert’s life, as he had wanted. We see a man who’s deeply devoted to his craft and calling as well as uncompromising (and abrasive) in his execution of his vision. He was often a difficult man to work with and be around (as Gene Siskel could have attested to). But he also had a clear softer side, evidenced by his powerful interaction with Ava DuVernay (director of Selma) as well as his reaction to Siskel’s surprising and devastating death. Ebert was forever changed after Siskel’s passing, vowing to be as transparent as possible if he were ever to have serious health issues. Unfortunately, he was forced to follow through on that vow when he was diagnosed with cancer, which ultimately took away his ability to speak but still couldn’t stop him from watching movies and writing reviews until he passed away. As an aspiring screenwriter and filmmaker, I found Ebert’s desire to support talented but unknown filmmakers both inspiring and comforting. He wasn’t doing anything from a selfish place but truly believed in having strong, diverse and distinct voices heard by a public that would typically miss them. He took his duty as a gatekeeper for the American public seriously and the world of cinema is better for it. I love this quote in its entirety, but that last part has really stuck with me since I first read it. Even before I was writing reviews for public consumption, I’d always struggled to balance my personal reaction to a film and how that reaction would be interpreted and judged publicly. That applied even with opinions as relatively private as my IMDb film ratings. I’d hem and haw and adjust based on meeting some imaginary jerk’s standards, in constant fear that someone would find my giving Blade Runner a 7 (I really, truly want to love that movie… but I just don’t) a sign that I was simply too stupid or misinformed to have good taste. But reading this quote, I’m empowered in a way that I don’t think I had been before. Roger Ebert didn’t feel like he needed to artificially adjust his ratings or criticism in deference to others. I don’t need to either (although, to be fair, it may be easier to stick to your guns when you’ve already established yourself as arguably the greatest film critic ever [although, it seems reasonable to think that sticking to those guns is part of what got him there]). On that note, my respect for Ebert has grown so much as I dabble in my own film review writing. He could apparently pump out a fully-formed and polished review in about half an hour, a fact that boggles my mind since it takes me between 3-5 hours to finish something that pales badly in comparison. I started recording my ratings for the movies I’d seen back during my sophomore year of high school (wow, about 10 years ago). As a burgeoning cinéphile, being able to track and review every movie I’d ever seen struck me as an incredibly cool idea as well as a way to compete with other movie nerds. Towards the middle of college, I hit the 900-movie mark and I found myself brimming with pride… until I heard this chilling statistic: Roger Ebert had seen over 10,000 movies in the last 25 years. I quickly did some math… I’d pretty much have to quadruple my yearly movie viewings to match him. It was staggering then and is somehow even more staggering now… I’m simply left in awe of this man’s love of movies. I heard Richard Roeper once say that Ebert was astonishing because after some obscene amount of time spent watching movies for work, Ebert would go home and relax… by watching some more movies. If you (the “you” in that analogy) find that this applies (if you’re reading anything written by the Flim Crickets, it does), watch Life Itself. Whatever love you already have for film (and life itself [I’m insincerely sorry]) can only be strengthened by experiencing it. I’d say you owe it to yourself. As I continue to grow and evolve as a writer, a critic and a lover of film, it’s comforting to know that I can look to Roger Ebert as a source of inspiration. It can also be intimidating seeing him as that unreachable ideal. The one thing that does boost my confidence a bit is that I’m pretty sure any of my completed screenplays is better than his Beyond the Valley of the Dolls. My everlasting regret is that I’ll never be able to hear him agree.